Welcome to 2019! As usual, it has been a very busy holiday season and I'm due back at work next week. But, I feel like I have accomplished a lot these holidays so am feeling rather chilled at the start of the new work year. Week 1: Down to Melbourne to drop my 2 daughters at my Aunts to work the summer holidays down there. Flew back on the Thursday and was driving up to Mackay the next day. Week 3: New Years celebration down the coast and started my full on bathroom makeover. I now know how to change over a toilet and have a beautiful bathroom that I sanded, repainted and also remade the vanity drawers so they actually open and close. Took me a whole week. So what was for this week? I decided to try to install an irrigation system to water my yard as it was just getting away from me. I am now in the process of putting in the drippers but cause it is so hot, I'm only doing it in the arvo's and it is a slow and tedious process but will be worth it in the end. As such, I have not planted anything new but my older plantings are coming to fruition. We are getting plenty of Corn and cucumbers at the moment. You can see the older planting of corn and the new set, plus I have a 3rd 1/2 bed planted. My capsicums, which I was worried was in too much shade at my garden visit to fruit as set HEAPS . I took this photo about 5 days ago and they are the size of my hand now. I brought these heat tolerant broccoli seeds from Lambeys nursery and decided to see how they would go. Peak summer and they are looking fantastic. These were Happy Rich F1. I only planted 3 because I wasn't sure how they would go. I'll keep you posted but we may have found a broccoli that will do well over summer. I bought a "blueberry" diggers tomato from that supposed diggers festival at the botanic gardens a couple of months a go. It is very prolific and the tomatoes are pretty (not the best as I had forgotten to water and died off a bit) but the tomatoes are not sweet so won't be planting again. Lucky I bought the Dwarf ducasse because I ended up not getting round to cutting hands off and before you know it the bunch was ripening. Bats would have had a field day if it were up in the air. Lastly, I'll leave you with a photo of my xmas gift from my daughter and my counter argument that I sent to her once we got back to brisbane. I had REALLY sour toms when the bed was nitrogen deficient. Maybe they needed a feed? All my vegie crops are grown in self watering wicking beds which tends to reduce the amount of water needed. In this heat, I water every 5 days and my crops cope quite well with that. On milder summer weeks, it is every Saturday & during winter, I can go 2 weeks without watering. Russell, did you mean you grew a broccoli over summer that you saved the seeds for and it grew well this summer too?? 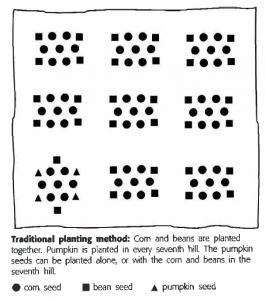 I would love it if you could save some seed and maybe distribute it at a garden visit. My broccoli is a hybrid and I really don't think saving seed from it will get me the same results. Side note though, even in this most horrible heat, that broccoli is STILL looking good. Dave, I tried the 3 sisters method and it never worked well for me. While I don't monocrop (there's always a mix of things in a garden bed) because of my limited space and intense turnover, I find what works for me is having organised sections of the same crop so they all go in at the same time and out for that section. Good weather for corn if you have the water to irrigate . I was going to try corn this year .... but its one of the crops I nixed due to lack of water available to me. Have transplanted corn without a problem where you may have gone wrong is putting more then one seed in container and disturbing the roots of the corn trying to plant in the ground some people recommend using more then one seed and discarding plants but that is wasting seed .If the corn is planted in small individual small pots those can be transplanted without a problem or best to plant the corn seed in the ground and use transplants to fill any gaps.The hot weather we are now having the other problem is the corn seed could over heat during the day in hot soil may need protection from the sun same with small pots i think i killed some corn seeds in small pots. After a desultory past trying to grow corn I'm now on a reliable winner with Balinese. As an heirloom variety, it has an exciting height and two cobs per stem. I clump plant and have had no pollination issues...although in my garden, corn suffers a tad in part shade so I need to take care where I plant. The traditional Indian template of the 3 Sisters required only a few in each clump. Cornel University suggests 7 per clump. Of note is the neglected 'fourth sister' -- the sunflower, which was planted near the clumps to attract pollinators. I do know that corn seed needs to be fresh so don't go buying your supplies in bulk or store it carelessly. And don't mix the varieties you plant if you want consistency of harvest. I'm using the stems from earlier crops of corn and sunflowers to grow tomatoes up. Today I planted some cucumber seedlings around the base of some shoulder high corn. We also grow corn in the school garden and the kids love it. However, we have learnt to embrace best practice and direct plant rather than raise seedlings. Like pawpaw, corn isn't keen on being transplanted. Contrary to the supposed impact sunflowers may have on other sown seeds, we grew them with corn in the one round bed with cucumbers sprawling in the mix. It was a jungle of plants which were all harvested. I get my corn from the Seed Collection --LINK-- in batches of 20 which is enough for us when I successive plant each 20 at a time. I can still make myself laugh. I do most of my pots with drippers that I put in. Works quite well.